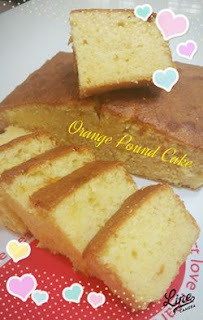 My son loves heavy type of cakes and when I saw this Orange Pound cake recipe from My Mind Patch, I decided to give it a try. This cake indeed has a tight texture just like those Sara Lee Cake sold in supermarket. This was really a yummy cake and definitely a great recipe to keep. * Note: I double the quantity to make a square pan size. 1. Mix cake flour, milk powder and baking powder and sieve into a bowl. 3. Whisk butter and sugar till light and fluffy. 4. Gradually add beaten eggs to the batter. Mix well after each addition. 5. Add flour mixture and mix briefly. 6. Mix in syrup, vanilla extract and orange juice.Use spatula to mix well. 7. Pour batter into (greased and line with parchment) square baking pan. 8. Bake in preheated oven at 170 Deg C at lowest rack for 40 mins, turning on only the upper heating coil.After 40 mins, turn on both the top and bottom heating coils and continue to bake for 30 mins or till skewer comes out clean. Slice the cake when cooled.